VietNamNet Bridge – Nguyen Lan, Ha Noi’s former Chief Architect, speaks to the newspaper Kinh te & Do thi (Economic and Urban Affairs) about some of the measures needed to keep the capital clean and green. First, the building of a lakeside walk has helped prevent illegal encroachment into the lake. Many households and developers living close to the lake have nurtured the idea of illicitly expanding their land to add value to their real estate. If the embankment and lakeside walk had not been built, I’m pretty sure West Lake would soon have become a pond. In your opinion, are projects to renovate rivers and lakes in Ha Noi similar to those in other countries? I just want to say Ha Noi’s rivers and lakes are all poetic. So are those of other countries. All countries, including Viet Nam, have developed plans to utilise their beautiful scenery for recreational activities to attract local people and foreigners. But in our own case, we have faced many challenges, particularly the problem of illegal land encroachment, littering and waste dumping. With proper conservation and investment programs, we can earn quite a lot of money from these places. 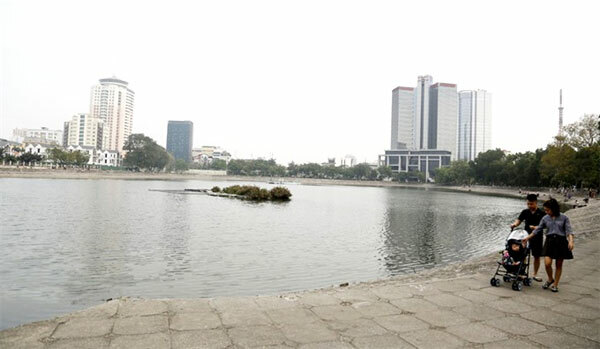 Ha Noi has initiated quite a few projects to renovate its rivers and lakes. But some only appear on paper. Do you know why? I have to admit that Ha Noi has invested quite a lot of money in dredging rivers and lakes. But due to poor environmental awareness, many rivers and lakes have become seriously contaminated. We all know the cost of keeping the surface water clean is high. So is the technology and expertise in this field. This has been a headache for Ha Noi authorities. I don’t think the problem can be solved in one day. It requires a long-term strategy. Many people have complained that dredging rivers and lakes is very costly and does not generate any return. This is very wrong. Once the lakes and rivers’ water quality is improved, no doubt it will add value to the city’s aesthetics and increase the number of tourists to Ha Noi. Of course, in the course of preserving the rivers and lakes, we need the participation of people from all walks of life. In addition, we should launch campaigns to raise people’s awareness to environmental protection, particularly people living on the riversides and next to the lakes. I’m pretty sure that when people and authorities are on the same page, lakes and rivers in the capital city will be clean – a good place for everyone to take a stroll after a hard work day, a place for children to play and an attractive destination for tourists.